According to the theory of left-brain or right-brain dominance, each side of the brain controls different types of thinking. Additionally, people are said to prefer one type of thinking over the other. 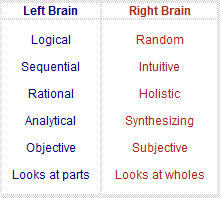 For example, a person who is "left-brained" is often said to be more logical, analytical, and objective. 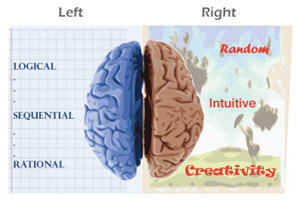 A person who is "right-brained" is said to be more intuitive, thoughtful, and subjective. However, I am told this is pop psychology and a myth. Experimentation many years ago has shown that the two different sides, or hemispheres, of the brain are responsible for different manners of thinking. Most individuals have a distinct preference for one of these styles of thinking. Some, however, are more whole-brained and equally adept at both modes. In general, schools tend to favor left-brain modes of thinking, while down playing the right-brain ones. 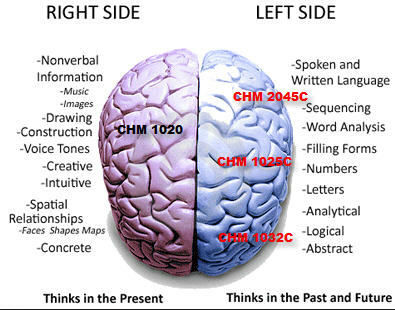 So here we are in CHM 1020, Liberal Arts Chemistry, taught by those professors who favor their left brain. But this special chemistry is also designed for the right brain student, ( except for my nursing/allied health majors and computer science majors who make up a portion of our class are probably left brain dominance). My problem is how to design the course for students with either brain dominance. I took it and came out 10 right brain, 9 left brain-result neither side is really dominant. include in the body your numeric results (#X Left-#Y Right).